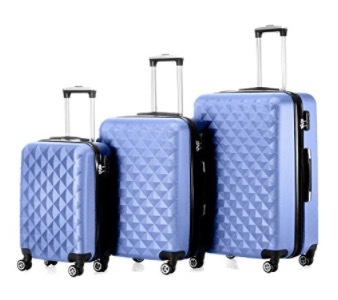 Timmari Luggage Set we’re reviewing on this page is made up of premium quality, practical, stylish and modern design suitcases of three different sizes- 28, 24 and 20 inches. They are all ABS, hard and strong with solid aluminum telescoping handles, double wheels and large and solid zippers with reliable and convenient TSA number locks. And they all have a great quality solid and robust hard shell. You are given the option to choose from seven different colors- wine, orange, peach, lavender blue, purple, mint green, and champagne. The champagne color set has a slightly higher price tag than the rest at the time of this review and we can kind of see why. With the TSA type of lock, the TSA can open your suitcases and inspect them without giving any damage to the lock. All are expandable and you will have about 1.5 inches of depth- more storage space. All three suitcases (the 20, 24 and 28 inches) have the double spinner wheels that rotate 360 degrees smoothly and quietly. So you can maneuver them on airport terminal grounds by holding the sturdy metal telescoping handles that lock at different levels conveniently. 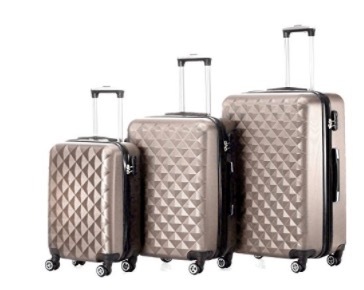 Shorter and taller people can wheel them comfortably.You’re getting three hard, sturdy, functional and practical suitcases to the price of one when you purchase this set. The good thing about having a suitcase set of different colors is that you will not be mixing yours with others’ on the conveyor belt. You can fit in as much as you want in the largest 28-inch suitcase that measures 29.5 x 19.5 x 10 inches and weighs 10.1 pounds. The 24-inch medium luggage weighs 8.4 pounds and measures 25 x 16 x 10 inches, so it is quite spacious inside too. And the smallest 20-inch is 6.6 pounds and measures 21.5 x 12 x 8.5 inches and meets the restrictions of most US and European airlines as carry-on luggage. Smallest cabin luggage will be placed in the 24″ medium one and the medium into the largest suitcase during shipping and the whole thing weighs 23 pounds with the package measurements of 31 x 19 x 12 inches. They are promised to hold up well over many travels over time without major scratches or dents. Please note that the plastic bags can smell for a little while then the smell will go away if you air them. All Timmari products are inspected at their US facility and they promise some of the best quality products out there for the price level.